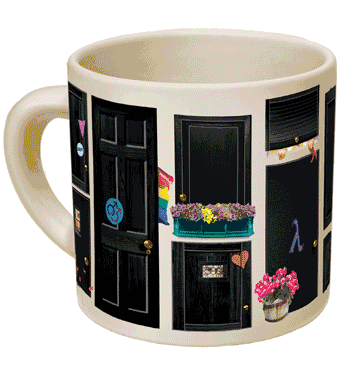 Add a hot beverage and 14 great gays from history emerge from the closet! For the most outrageous and proud cup of coffee ever! Mug features: Willa Cather, Walt Whitman, James Baldwin, Pyotr Ilyich Tchaikovsky, Freddy Mercury, Oscar Wilde, Sappho, Alan Turing, Audre Lord, Andy Warhol, Michel Foucault, Yukio Mishima, Gertrude Stein.